St. Martin's Griffin, 9780312607340, 336pp. 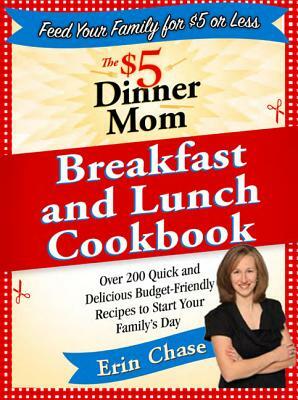 The $5 Dollar Dinner Mom--savings guru, savvy supermarket shopper, and mommy extraordinaire Erin Chase--does it again! With the same fool proof system she used to cut your weekly food budget and put a healthy and delicious $5 meal on the dinner table for your family, she takes it one step further with "The $5 Dollar Dinner Mom Does Breakfast and Lunch". Tailoring her tips at how to size up supermarket deals, clip coupons, and create weekly menu plans, she helps you start your day the right way. With the help of Erin--whether at home or on the go--you can use all the same tools you learned in "The $5 Dollar Dinner Mom Cookbook" to create breakfasts and lunches for less than $5 that are easy and kid-friendly too!